High-frequency current (thermolysis) – With the arrival of powerful computerized epilators, high-frequency current or thermolysis is nowadays extremely effective. Today’s technology enables us to work with very short treatment times, in thousandths of a second. Thermolysis can therefore be very convenient when compared to combined currents that require a treatment time of 4 to 15 seconds per hair. 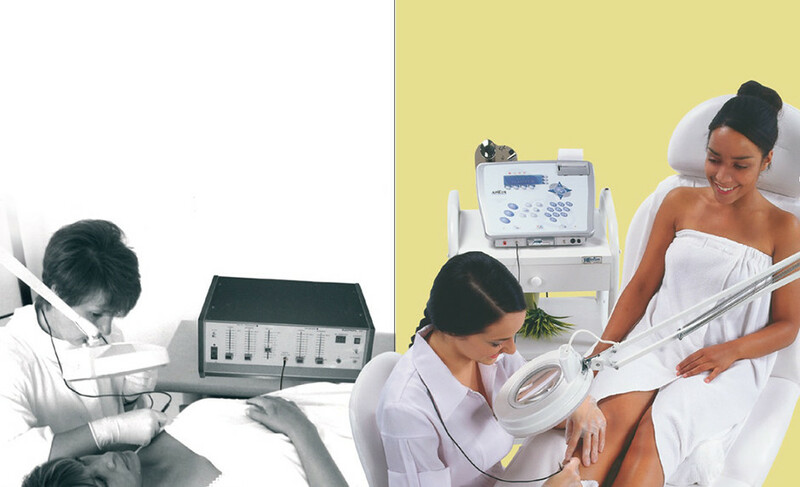 As for combined currents (Blend), there are many different ways to use high-frequency current in electroepilation. The first is slow thermolysis. This type of thermolysis requires a treatment time of several seconds, which makes it obsolete in today’s hair removal market. Then there is conventional thermolysis. The current treatment time for this technique is measured in tenths of a second (0.1 s), which is not always comfortable for the client. The ultimate in terms of speed and comfort is indisputably the new PicoFlash™ technique. This technique is now possible thanks to the ultrarapid 27 MHz frequency, available on the Apilus® Platinum™. Thus, since this frequency is 56 times more rapid than in the first epilators and twice as rapid as that used by most devices on the market today, it is able to coagulate in a very targeted fashion the cells responsible for hair growth and avoid heat diffusion in nearby tissues. The PicoFlash™ 27 MHz technique thereby offers effectiveness and comfort never before seen in permanent hair removal!Fortunately, electrologists today have access to a number of other thermolysis methods that offer speed and comfort. A fairly widespread technique is known as Flash™ thermolysis. This type of thermolysis uses the 13.56 MHz frequency and works in hundredths of a second (0.01 s). Most epilators on the market, including the Apilus® Junior 3G, offer this technique. Next comes the MicroFlash™ technique in thousandths of a second(0.001 s). This method is quite popular and very well liked by our international clientele as it offers superior comfort (available on the Apilus® Senior 3G). The most appropriate thermolysis technique for stubborn, deeply rooted hair is certainly the MultiPlex™. This “hybrid” technique is a mixture of slow thermolysis (from 0.5 to 2.5 s) and rapid thermolysis in thousandths of a second (0.001 s). The slow thermolysis current starts by generating heat in the internal structure of the entire hair follicle, which is then more effectively destroyed with a pulse of rapid thermolysis (MicroFlash™ or PicoFlash™ with 27 MHz technology). Since the MicroFlash™, PicoFlash™ and MultiPlex™ techniques are extremely quick, many electrologists now use the “dual-pulse” technique. This technique consists in sending a first pulse in the bulb area then a second pulse in the bulge area, the two target areas that contain cells responsible for hair growth. Thanks to the proportional pulsing function of superior Apilus® epilators, the device automatically reduces parameters when using this method to avoid generating excess energy in the hair follicle. And last but certainly not least comes the Synchro™. This technique, available on the new Apilus® Platinum™ 27 MHz system, is a truly revolutionary method (patent pending). The 27 MHz technology allows us today not only to offer treatments with unrivalled comfort, but also deliver extremely quick results. This method develops a significant amount of energy in the hair follicle, yet always keeps the skin surface protected since it is used exclusively with insulated probes. 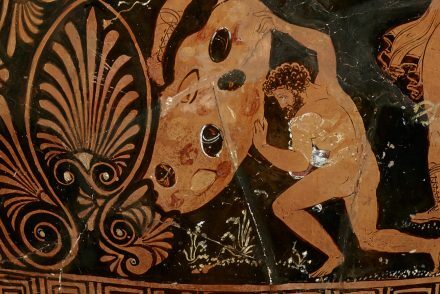 Of course, given its strong destruction potential, the Synchro™ is used only on deeply rooted hair in the anagen phase and calls for a specific technique that requires extra vigilance from the electrologist. This new working method consists in delivering up to one hundred ultrarapid picopulses in the hair follicle. Pre-defined parameters set according to the body area, the depth and size of the hair guarantee safe and effective results. The 27 MHz technology encompasses components that enable us to work with currents in milliseconds, at a very high intensity and allowing for a rest period between each pulse. This system therefore ensures healthy tissues around the hair follicle will not be destroyed. Pulses are concentrated exclusively in the target areas. Unfortunately, in trying to destroy hair as quickly as possible, certain electrologists use personalized methods that are often too powerful, unaware of all the consequences related to this practice. Let’s not forget that a germinative cell dies when the temperature exceeds 45 degrees Celsius, and that collagen can be damaged starting at 55 degrees Celsius. We must therefore be very careful not to destroy collagen and elastin fibres, create pigment spots, cutaneous depressions or other permanent damage. Quite often, the skin initially seems to react very well, but there may nevertheless be strong inflammation inside the hair follicle or the skin surface may become whiter. All epilators are not necessarily designed to apply a multiple pulse technique such as the Synchro™. Don’t forget that the 27 MHz technology in the Apilus® Platinum™ is ultrarapid, highly concentrated, can deliver 0.001 s picopulses, AND can insert a resting period between each pulse to let adjacent cells cool down. Isn’t it wonderful! Of course, the success of these techniques also lies in the quality and accuracy of the electrologist’s insertions, since the idea is to directly target cells in the germinative zone, the dermal papilla and the bulge. It thus becomes necessary to learn a new technique specifically developed for the Synchro™. We must be able to meet the requirements of our esteemed clients and stay at the leading edge of technology. We must be able to face head on the ever-growing competition in our field. Another avenue for electrologists who wish to offer effectiveness, comfort and safety to their clients is to use insulated probes. The latter can concentrate energy at the tip and thus shorten treatment time while protecting the skin surface from any reaction. Thus, the risk of burns, pigment spots and scarring is nil. Electrologists who seek quality in their work should therefore use only this type of probe. Pro-Tec® offers two types of insulated probes, namely IsoGard™ and IsoBlend™ probes. 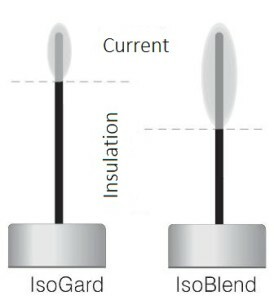 IsoGard™ probes are recommended for shallow insertions; to treat either hair in the telogen phase, lanugo facial hair or near the end of a course of treatment, when hair is not as deeply rooted in the skin layers. We use this type of probe in thermolysis only. IsoBlend™ probes, on the other hand, are recommended for all types of hair on all areas of the body with minimal depth, and are used in both thermolysis or Blend. For more than 135 years, electrolysis has never ceased to evolve. We have now reached a high level of effectiveness with the new 27 MHz technology; it’s now up to us electrologists rise to the occasion. Let’s not forget that our clients are much better informed today than they were in the past, thanks namely to the American Electrology Association (AEA), the Association des électrolystes du Québec (AEQ), the internet and many magazines of various interests. Let’s stay updated on our techniques, and above all, let’s be professional. It is in our best interest and especially in our clientele’s best interest. Let’s do our best to give our best!